Winlife PVC Windows is suitable with any glass thickness between 4mm to 44mm. Glass is comprised of mainly silica that is found in sand. Glass is used in various applications as doors, windows, conservatories, bottle, and vision glass. These glasses when used in windows (double glass window) can act as energy exchanger and can reduce the efficiency. To increase the efficiency of the room, the energy exchange should be measured either from window frames or glass. Pilkington K glass has a special coating on the inner glass surfaces facing the air gap which reduce the energy emission to the outer glass. A thin coating helps to reflect back the energy and maintains the internal temperature towards the colder outer atmosphere. This coating helps to reflect back the energy and also allows heat from sunlight to enter the house so keeping the residence warm. Thin coating on the inner glass sheet makes it at room temperature and provides larger usable space. Pilkington K glass helps to maintain the internal room temperature with or without heating making it greener by energy saving so with Pilkington K glass you can achieve higher efficiency. In colder atmosphere the window region is the coldest part of the house but with Pilkington K glass it is not the case. It can also be used in conservatories as it maintains the heat from sunlight and make the inner atmosphere pleasant. Pilkington K glass can also be laminated or toughened to increase its strength and durability. Due to its energy efficiency it becomes the first choice for architects and also raises the energy ratings and saves on energy bills. Please contact us to know when, where and which glass ware you will need. Everglade has formed well-built affiliation with glass suppliers like Pilkington to bring you the best quality glass. The main transfer source are doors and windows and they should be checked for efficiency. Door and window profiles and double glazed panels are energy efficient. The highest area in a door or a window is covered by glass so it is of utmost importance that the glass does not transfer much of the energy. So to solve this purpose double glazing units are used. Double glazing units are made up of two glass sheets. In between this double glass sheets there is gas filled in it, commonly argon gas is filled in it. This unit is made up of two 4mm glass sheets separated by a gap of 16 to 24mm. The higher the gap the less the conductivity of thermal energy, this gap is filled with inert or noble gases such as Argon, Krypton and Xenon. Commercially Argon is filled in the gap to separate two glazing sheets which acts as a non conducting medium for thermal energy. These glass units are then sealed from the periphery so as to make the unit air tight. The double glazed units are then installed in doors and windows to make them more efficient and installed as either externally or internally beaded in window and doors. 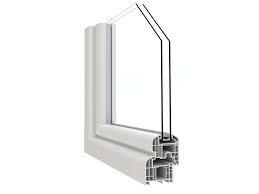 At Winlife PVC Windows - Double glazing windows and double glazing doors are made in PVC materials. Buy it at affordable price rate or get free quote online - please contact us. Double glazed or double glazing is used to prevent energy loss. A house is made up of various materials. These materials have their own purpose to serve according to their properties. To make your house more efficient the sources of energy transfer should be controlled. Bit by bit, we are being encouraged to switch from single to double glazing and further double to triple glazing. You may not have noticed yet but the pressure is on to improve the energy performance of windows and we are now reaching the stage where mere single glazing will no longer be enough. The rough and ready method of comparing the energy performance of windows is to use the Uvalue measurement, just as we do with walls, floors and roofs. Traditional windows, with a single pane of glass in them, have a U-value in excess of 5. Double glazing used to score over 3, but, over the years, the manufacturing process has undergone a number of improvements and currently the Building Regulations insist that any window you install today should have a U-value no worse than 1.8. Wider cavities between the two glass panes 16mm is the optimum distance. 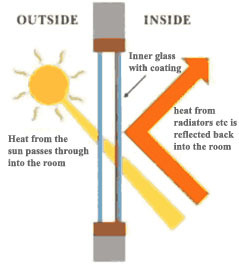 Low-emissivity coatings being added to the glass to stop heat escaping. The cavity being filled with an inert gas, usually argon. Designing out cold bridges, such as aluminium spacers, surrounding the glazed units. Now, a U-value of 1.8 may look good when compared to what we have been fitting relatively recently, but compared to the U-value demanded for walls currently less than 0.3 and due to fall even lower you can see that windows remain weak spots in the overall thermal efficiency of a building envelope. Hence the tremendous pressure to improve their performance even further. The question is, does this mean the next step is to move from double to triple glazing? Opinion is divided. Triple glazing is widely used in cold climate countries like Sweden and Norway, and the ultra-lowenergy PassivHaus standard requires triple glazed windows with a Uvalue of no more than 0.8. 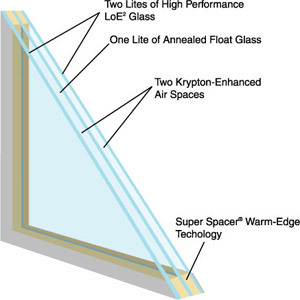 To get a window with such a low U-value, you have to not only switch to triple glazing but also insulate the frame itself, as well as using more expensive manufacturing techniques the gas krypton tends to be used, instead of argon. Now, though a U-value as low as 0.8 sounds very impressive, the additional energy we are saving is minuscule. And to make things more complex, windows behave rather differently to walls and roofs in that, when the sun is shining, they are capable of absorbing heat. In fact, the very best double glazed windows are already capable of being net heat contributors over the course of a heating season. In contrast, triple glazed windows slightly reduce the heat absorption characteristics of a window. So why are we even thinking of going triple glazed? It's all to do with the Code for Sustainable Homes, which the Government is using as a roadmap for us to move towards building zero-carbon homes.